This is might be my absolute favorite polish that I own. I LOVE pastel colors and they are still super on-trend. 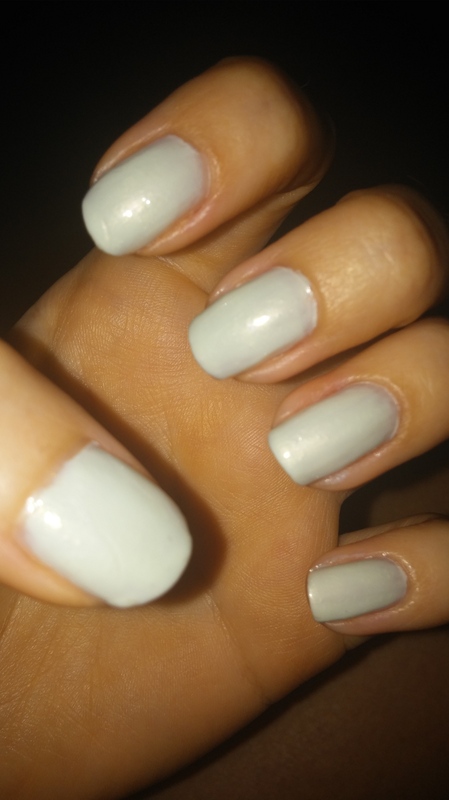 This is the shade Sea by Sally Hansen, it really does remind me of the sea foam on the tips of waves at the beach. It was difficult to photograph it, but it’s a lot prettier in person! 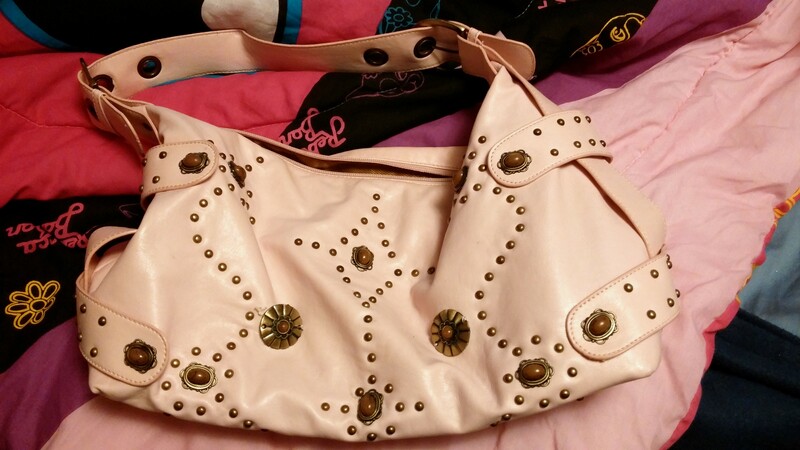 The best thing about this hue is that it makes my tan pop, which is a big deal for me in the summer!! This is my favorite finger nail polish. It’s sooooooooooooo pretty I can’t stop looking at it!! It’s a muted pink pastel color that reminds me of a a raspberry smoothy or cotton candy. I just can’t get over it. 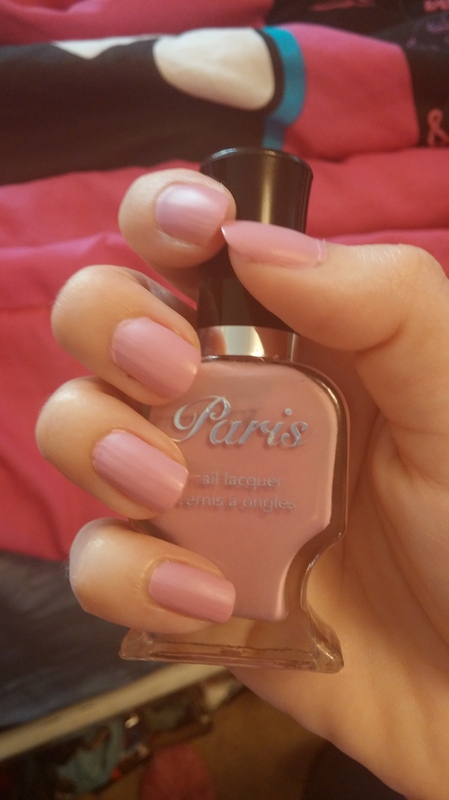 I love pastels and how there is no shine, I get tired of regular polishes that are all bright and shiny. 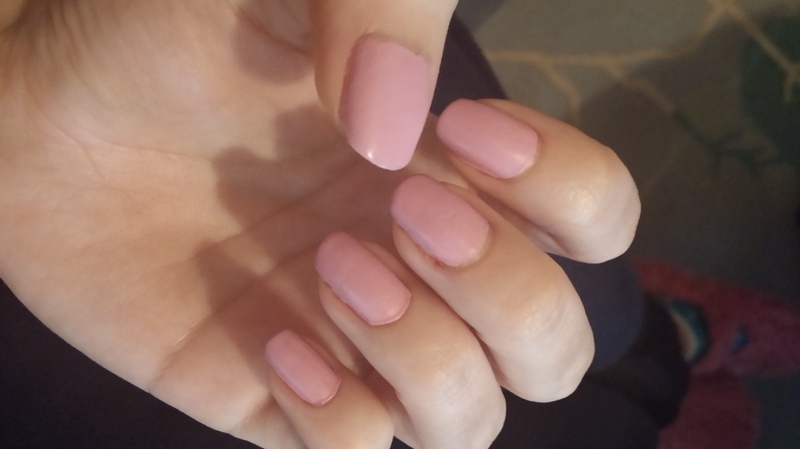 This is a great matte spring color especially with Easter around the corner. I got these two sweaters for Christmas. They’re both over-sized sweaters from Victoria’s Secret. They are off the shoulder, fleece on the inside, and very on trend right now! They are pretty comfy so I can’t complain. I posted two ways to wear these pastel beauts in a semi-80’s fashion. I should have worn my hair up in a side pony or gotten a perm LOL, I just wasn’t in the mood. =p Also, I wasn’t alive in the 80’s so I don’t know a lot about it, maybe someone should let me in on some 80’s style secrets since I am not too familiar. 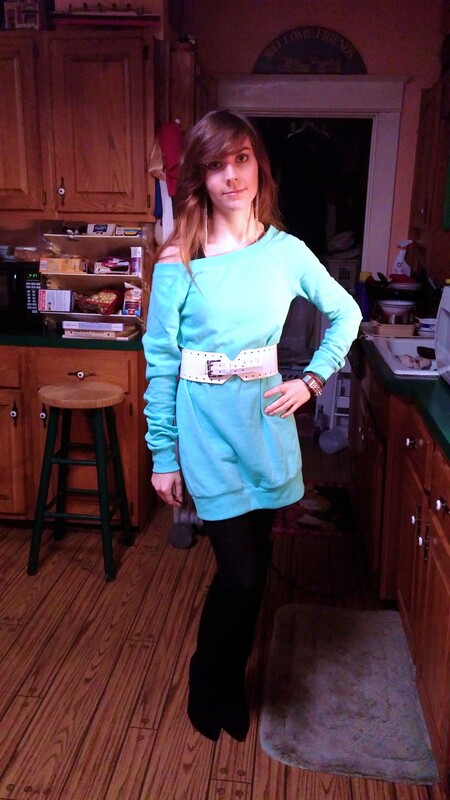 In this first photo, it features the pastel aqua colored sweater. I paired it with this wide chunky white belt to give it some personality. This belt is from elegant White House Black Market. The belt ties together the outfit because it’s statement piece, so I didn’t nee many other accessories. 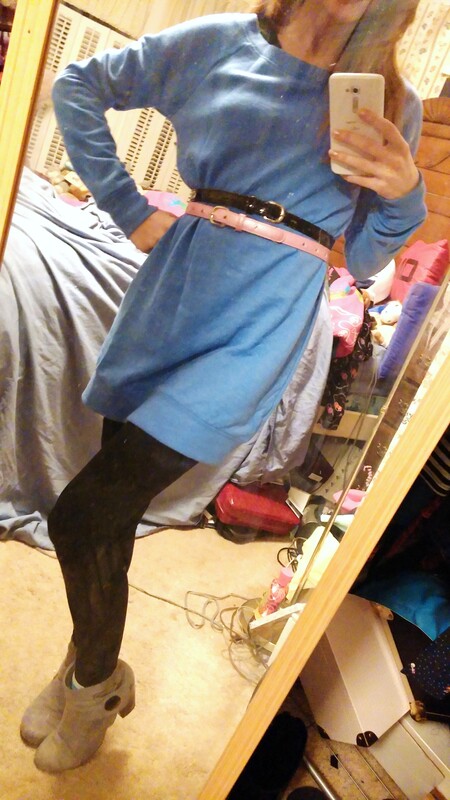 I paired it with a black tank top, black leggings, and my knee high boots. In this second picture, I am sporting the pastel blue sweater. I put two slender belts side by side to add extra character. These belts are from the child’s department at Target. I got them when I was a teenager because I thought they were super cute and they fit my waist better than belts that are in the junior or adult sections. I paired it with black leggings and black tank top, and my grey suede booties. Btw, that mirror is clean, Idk why it looks bad, probably just the lighting! Tell me which outfit you like best! I wore this to the mall the other day. Yes, I know that it is supposed to be outfit of the day, but it doesn’t have to be from today! =p It’s just a fun weekend outfit, not much else to it. The pastel blue shirt is from Pacsun. I was drawn to it because it is a crop top and the bunny on it is adorbs! Uh, you can kind of see my bra under it so I might as well tell where it is from, haha! It is a hot pink wire-less bra from Victoria’s Secret. The hot pink board shorts are Dickies. I wore them with this crop top shirt because I didn’t want to wear short shorts since my stomach was already showing, I didn’t need to show any more skin. I tried to balance it out by not showing as much of my leg. The white studded belt is from Hot Topic. The blue jelly shoes glow in black light! They aren’t a brand that I know of, just from some shop in Boone, NC. The three quarter length crop leopard sweater is from Belks I think. My Hello Kitty necklace is from Helsinki! I love it, it was handmade so no one has the exact same one. In my hair I have lavender pastel extensions.